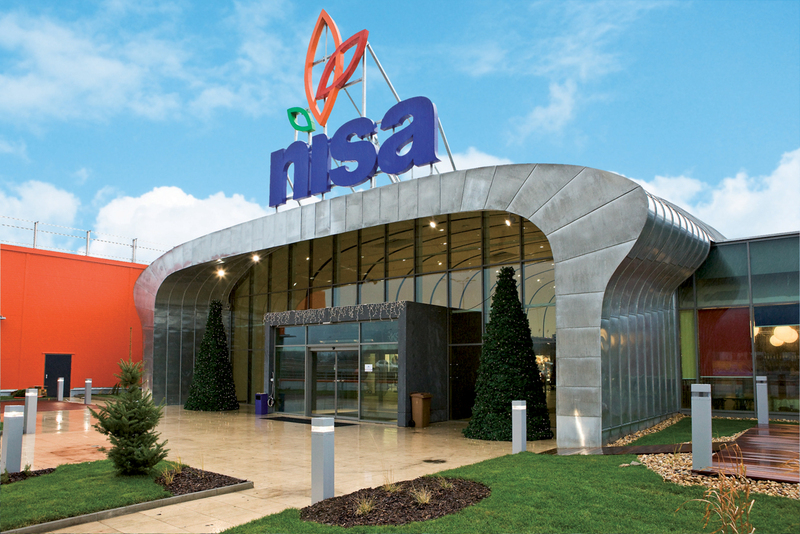 This unique center of entertainment in the Czech Republic offers a wide spektrum of fun for families with children. The roofed compound includes Aquapark, Lunapark, iQpark, XD theater, Wellness, restaurant. Available from Penzion Jasmín about 2 minutes by walk. Modern science center with Planetarium and hundreds of exhibits. The world of science and technology which will captivate you. The world of amazing experiments and smart fun. You will find there these exhibitions: GEOlab, Water World, Elements, GEO, exhibitions of Technical University of Liberec, Human, Science in the Home, Czechs of the World, Relaxation zone. You can also visit Planetarium, where you can see Universe as if it was within the reach of a hand. 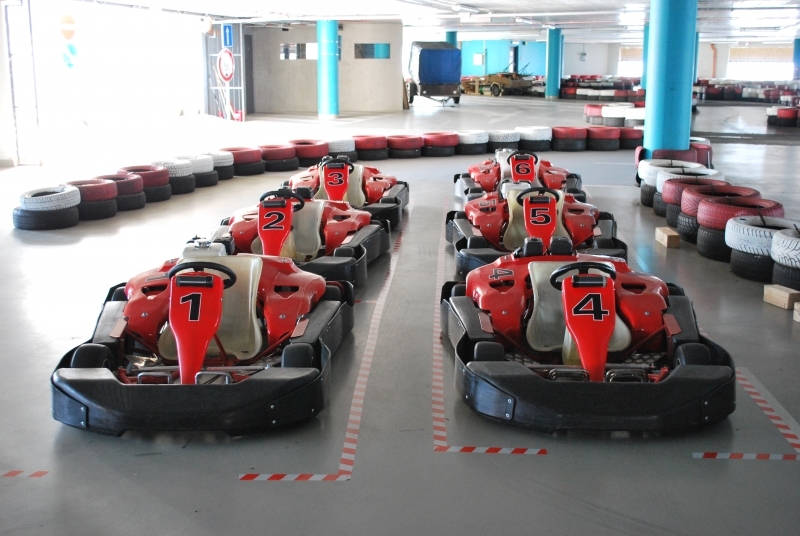 Go-karts – The biggest roofed track for go-karts with year-round running in the north of Bohemia. Technical track which is 3m to 6m wide and 400 m long enables you to drive fast on long straight ways. The go-karts are in top condition and they have got new engines Honda GX 200 ccm. The go-karts with engines Honda GX 160 ccm are meant for children up to 7 years old. The high-quality helmets, hygienic hats and thermally insulated gloves are included in the price of the race. There is a trendy bar with the view of the whole track of go-karts. There is also roofed terrace with heating and the view of the track and also of the center of Liberec. They are equipped with 2x LCD TV, SAT with sports broadcasting and of course they also have Wifi FREE zone. There is LCD TV in the terrace and TV with online broadcasting of the current race in the depot. They also have got X-BOX 360 simulator with the sports seat, the newest games high quality dolby 5.1. sound. You can get there Italian coffee Espreso Carraro, beer Pilsner Urquell, non-alcoholic beer Birell and much more. They offer complete catering services – from basic bashes to professional catering from the company AUTENTICA Liberec. You can walk within the barriers of the whole length of the go-kart track. The shopping and entertainment center Fórum offers comfortable and peaceful shopping in the middle of Liberec. It is near the Entertainment center and Aquapark Babylon and Entertainment center IQ Landia. Cinema City is the part of the entertainment center Fórum. It consists of 5 cinema halls and three-dimensional Dolby Digital sound. Two cinema halls have got 3D Master Image system and silver wide screens. 5D Cinema Maxim – the Projection in 5D Cinema Maxim functions on the principle of combination of high quality 3D picture which is watched by 3D glasses, comfortable seats which can move to almost all directions, high quality sound and added effects such as wind, and steam during the ride round the waterfall or for example the slight tickling on the legs which imitates flying dragonflies. The neo-renaissance City Hall was built by the well known company Sächers and Gärtner according to design by French architekt Franz Neumann, so it is no wonder that the building resembles the City Hall from Vienna. There are a stone relief and balcony above the massive entrance portal. The stone relief represents founding of the old and new City Hall. Interesting part of City Hall is the 61m tall main tower which ends with the sculpture of the knight. The richly decorated facades, rare stained glasses and exquisite ceremony room which is the demonstration of precise crafted work also deserves attention. Despite the age the City Hall remains one of the most precious architectonic rarities of the city under the Ještěd. Available from Penzion Jasmín about 10 minutes by walk.. The north Bohemian Museum belongs to the biggest Museums in the Czech Republic. It was founded as the industrial Museum in the year 1873 and it is the eldest Museum of this type in the Czech Republic. Nowadays the north Bohemian Museum includes not only rich library but also 3 departments of collections that is the department of biology, the history department with archeology and the department of history of art. The restored renaissance tower of the former City Hall in Liberec is also a part of the building of the north Bohemian Museum. Available from Penzion Jasmín 15 minutes by tram, 10 minutes by car. 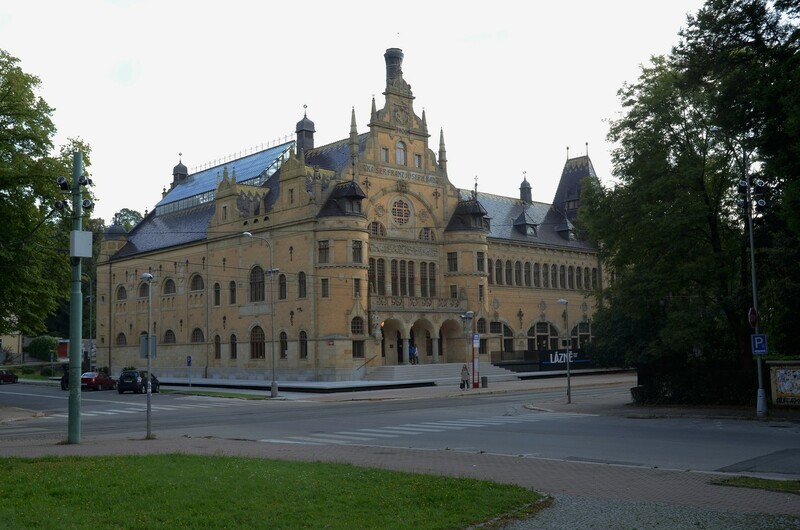 The Regional gallery Liberec is the specialized institution of collections – Museum of art – in the region of Liberec. It takes care of large collections of art and you can visit 3 permanent exhibitions of European and Bohemian art. In the Technical Museum Liberec are exhibitions of historic cars, motorcycles and a lot of other technical objects which are related to region of Liberec. Besides other things there are exhibited bicycles, models of toy cars, steady engines or abundant exhibition of history of tram traffic in the region. DinoPark Liberec spreads over the 2nd and 3rd floor and on the roof of the shopping center Plaza. You can see extensive exhibitions of ancient dinosaurs. The visitor can get on the lookout by the Brachiosaurus and look at Liberec with the view of 7 m tall herbivore which is placed on the roof of the building. Nice seating of DinoCafé is also part of the roof. Ticket for family (2 adults and 2 children) costs 360 Kč. Available from Penzion Jasmín 10 minutes by walk, 7 minutes by tram. It is situated right opposite to DinoPark in the shopping center Plaza. Available from Penzion Jasmín 10 minutes by walk, 7 minutes by tram. Botanic garden Liberec is the oldest botanic garden in the Czech Republic. People in the Botanic garden Liberec takes care of the most varied collections of exotic plants in the Czech republic. 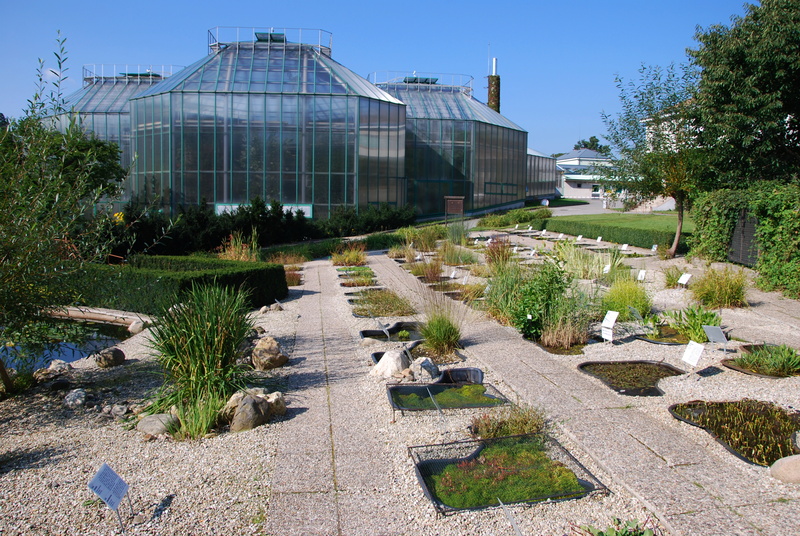 The Botanic garden is divided into greenhouse compound and outdoor compound. Exhibitions in the greenhouse compound hides a similar image to the colourful tropical and subtropical nature. In the outdoor exhibitions is climate of Liberec - submontane and humid. The outdoor exhibitions are adapted to this climate. The extensive alpinum with alpine vegetation. ZOO Liberec is the oldest zoological garden in the Czech republic. They breed more than 170 species of animals in the 13 hectare compound. 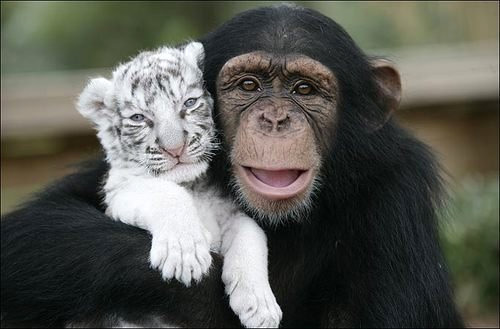 White tigers and seals bring the most attraction. Swimming pool Liberec offers modern services to the customers which are closely associated with the sport activities while swimming. There is a swimming pool, a training pool for children, a wading pool with water slide „water mushroom" and whirpool bath for children, slides and steam. The complex also offers relaxation activities such as fitness, wellness, saunas, spinning. There is also a 8,5m deep diving tower. Available from Penzion Jasmín 10 minutes by car. Lidové sady is one of the oldest center of the cultural and social life of inhabitants of Liberec. The visitors have been welcomed in Lidové sady since year 1901. The 32 meter tall lookout tower is the dominant of the compound. After overcoming of 155 stairs you will be rewarded by good view of Liberec with Ještěd and Jizera mountains. Available from Penzion Jasmín 15 minutes by tram. The extraordinary design of the building reminds of medieval castle. It was built from the stone blocks from the demolished houses in Norimberk. The courtyard is surrounded by the wall in which are watchtowers and loopholes. There is also 13m deep well with winch and castle bell.You can go to the lookout tower by car and park right beside the building. Available from Penzion Jasmín 15 minutes by car. 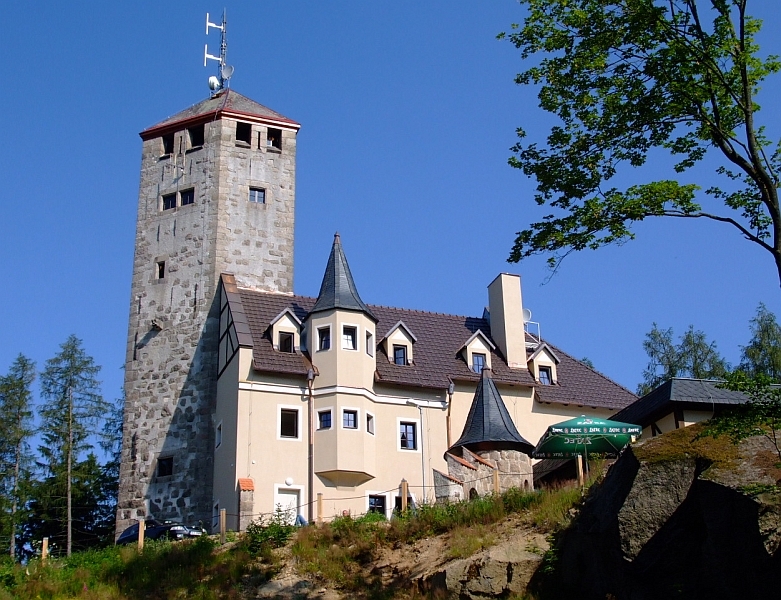 Ještěd – the biggest mountain of the Ještěd ridge (1012 m n. m.) has been considered to be one of the main dominants of North Bohemia and the symbol of town Liberec since long time ago. Ještěd is national cultural monument and the building of the century. The architect of the dominant of the region – the transmitter and hotel Ještěd – was Karel Hubáček. „Nový dům" was there before this unique building. „Nový dům" was the name of the cottage with restaurant on the top of the mountain, which was already opened in year 1906. The building „Nový dům" was destroyed by the fire in year 1963. Three years after this fire they began to built the present transmitter with hotel and restaurant. You can get on Ještěd not only by walk but also by cableway which belongs to the first hanging cableways in the Czech Republic and at the same time it is the only working cableway of this type in the Czech Republic. The cableway is over 1 km long and it was built in the year 1933. Available from Penzion Jasmín 15 minutes by car, 25 minutes by tram (to the station Horní Hanychov, then 10 minutes by walk to the cableway). Ski center Ještěd is modern ski center within reach of public transport in Liberec and it is well accessible by traffic. There are 2 cableways with four seats, 1 cableway with two seats and 6 ski tows in the ski center Ještěd. Ski center Ještěd is one of the most modern ski centers in the Czech Republic and is well accesible, especially for the visitors from Prague and from Central Bohemian Region . The Ski center Ještěd offers bicycle and touristic tracks for everyone in Summer. There is the new bike with 10 km long bicycle track, rental and service of mountain bikes and rental of off-road scooters. Discounted Skipasses!!! 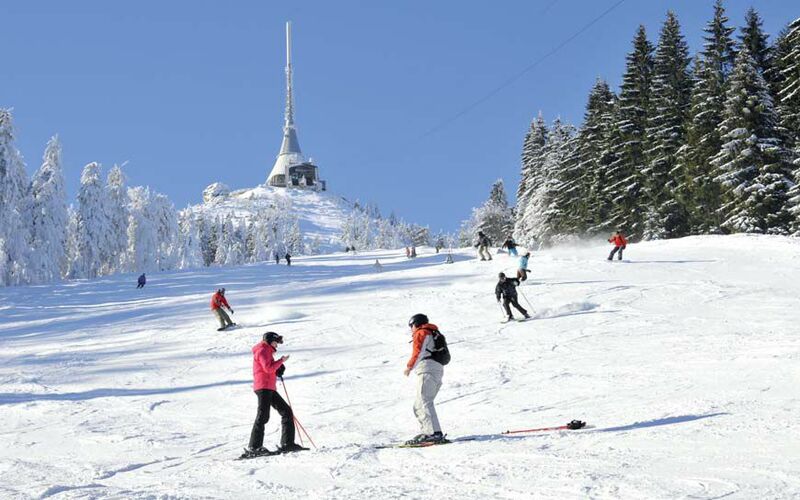 25% discount from the price of Skipasses in Ski center Ještěd for the guests of Penzion Jasmín. It is necessary to order the Skipasses at least two days before arrival to Penzion Jasmín! Every year cross-country skiing race Jizera 50 takes place here. Jizera Artery is located in the central part of the Jizera mountains and it belongs to the most visited resorts for cross-country skiing in the Czech Republic. Jizera artery is known for regular mechanical covering of ski track with length over 180 km. The biggest starting point of Jizera artery is Bedřichov which is available from Penzion Jasmín 20 minutes by car. Vesec resort was built for the World championship in cross-country skiing in year 2009. Nowadays the Vesec resort is used mostly in Summer. The music festival „Benátská noc", regular in-line races and sport activities for children takes place here. Shopping center in northern Bohemia in which you can find cinema Cinestar with 8 projection rooms, 160 shops, 1800 parking places – the parking is free. The children can play in the children's playground, there is café Coffeeshop Company with the children's playground. Regular children theatre plays take place every Saturday and Sunday at 16 o'clook and 17 o'clook. Children can also get ball ice cream ICE´N´GO. Available from Penzion Jasmín 10 minutes by car, 10 minutes by bus.